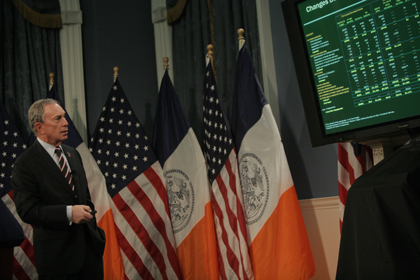 Mayor Bloomberg unveiled his budget plan yesterday, including hundreds of measures to close a deficit of billions of dollars [PDF]. While the most controversial element may be Bloomberg’s plan to lay off thousands of teachers, included among the smaller-scale deficit-closing measures is one that is sure to set up a fight over transportation policy. The budget again includes a 25 cent increase in the hourly rate for on-street parking in most of the city, a proposal which the City Council negotiated out of this year’s budget in January. In Manhattan above 86th Street and in the other four boroughs, meter rates would rise from 75 cents an hour to one dollar, raising $13.8 million in 2012. In Manhattan below 86th Street, meter rates are already scheduled to go up from $2.50 per hour to $3.00, a change which will raise $10.4 million annually. New York’s on-street parking — even the small fraction of it that’s metered — is priced far below the demand. Over the past 18 years, the meter rate hasn’t increased at all when adjusted for inflation. The enormous mismatch between the amount of on-street parking and the demand creating by the current bargain-basement prices is a major contributor to drivers’ inability to ever find a space on the street, to rampant double-parking, and to the city’s traffic congestion, as drivers circle the blocks hoping to get an open, discounted space. The Bloomberg administration has already tried once to enact the 25-cent meter hikes. However, led by transportation committee chair Jimmy Vacca, the City Council struck a deal last month to delay implementation of the increased meter rates in the boroughs and Upper Manhattan. They are expected to oppose the same rate hike now, setting up parking rates as one likely front in the coming budget battle between the mayor and the Council. $13.8 million is only a fraction of the overall budget deficit, but it’s also real money. According to the Independent Budget Office [PDF], $10 million buys 158 new teachers, 956 Head Start slots, or 10 days of residential garbage disposal. If Christine Quinn and the City Council choose to fight over the parking hike, they’re not only prioritizing a discount for drivers over congestion relief, but over everything else that money could buy. I’m surprised they don’t ripoff cars like they do commercial trucks, by making motorists pay for a full hour regardless of how long (or little) they plan to park. Commercial parking is now $2.50- 3.00 an hour (3 hour limit), which is fair enough, but you must pay for a full hour whether you plan to park for 1 hour or 5 minutes. That 1 hour muni meter receipt is not valid on another block. So trucks making several deliveries per hour must pay at each location, making the effective hourly parking rate much higher for commercial vehicles making many deliveries. Wow, only a dollar an hour! The parking meter rate should be tied to an average of market rates in the area, including for overnight hours, thus making the decision to use a commercial lot or curbside spaces irrelevant on a cost basis. I still think people will marginally prefer curbside for the convenience. Think about how many teachers, senior centers, etc that would pay for. One of the best concepts that Shoup has is that parking fees stay in the local area. If market rate parking stayed in a community board’s control, like paying for some of their local budget priorities, it would put a lot more skin in the game. Other than parking, in what other market for services with a vibrant, competitive group of providers is city government directly competing with that private market, using below-market pricing and not means testing the customers? Is curbside parking so fundamental to public safety and welfare that we should give it away free without any means or other test, like education, police, fire and sanitation services? In my opinion, no. We should means test and also needs test. Those who have no need for a car shouldn’t be granted an on-street spot at all, regardless of it they’re willing to pay market rate for it. If someone needs a car because they work somewhere not easily accessible by public transit, or are disabled, then they should be granted on-street at market rate for the duration that they’re working that job or are disabled ( and no longer ). If they can’t afford market rate based on their income, then you can reduce the rate to something affordable based on their income, even to zero if they’re poor. And market rate should reflect what commercial businesses in the area are paying for rent. Last I checked this averaged around $50 per square foot ( per month? ) in Manhattan. A parking spot is roughly 800 square feet, so a fair market price would be about $40,000 per month, or about $55 per hour. This is based on the assumption that commercial rents quoted in dollars per square foot are based on a month. They might be based on a year ( I don’t know the convention ), in which case just divide my figures by 12. In any case, it’s clear the city is grossly undercharging for parking. Even going by $50 per year per square foot, we should be charging close to $5 per hour for parking. Loading zones for delivery trucks of course are a different animal. We need more of those, and they should be free since they serve a necessary function. Ugh, I miscalculated above. A parking spot is closer to 200 square feet, not 800. Don’t know what I was thinking. So if commercial rents are based on the month, that would imply about $10,000 per month, or $14 per hour, for parking. If they’re based on a year, the figures would be around $833 a month, or $1.15 per hour. Not accounted for of course is the fact that commercial rents are based on making maximal use of very expensive land by going up 20, 30, 40, 50 floors, whereas on-street parking only makes use of ground level. As such, you might need to multiply the above rates by 10 or 20 or 50 to account for this. Like I said, it’s clear we’re grossly undercharging to allow people to park private cars. There really isn’t any significant economic benefit to doing so, either, in a city where most walk or use mass transit. As happens nearly each and every year when it’s time to disclose the budget there are threats and concerns regarding whether or not the U.S. Government will need to shut down for days, weeks, or even longer. Will many employees be furloughed or lose jobs entirely? How can we run our National Parks or pay those employees working under government contracts? And how about our income tax returns, how can we expect to be paid our refunds? There would be around 800,000 U.S. Federal Government workers who might be out of a job for a lengthy period of time.